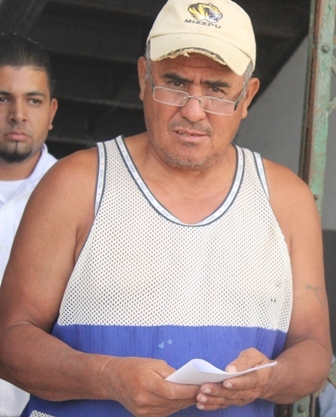 The Immigration Department made a bust this morning at a construction site which is managed by a Belizean-Honduran national, fifty-one year old Jesus Contreras. He was found to be employing four illegal immigrants from Honduras, namely Roger Antonio Barahona Moncada, Orlin Medardo Garcia Balico, along with Ivor Luis Arriola Ortiz and Gervin Arnoldo Espinoza Hernandez. The arrest was made at a worksite on Fabers Road where they were constructing a church which has now been halted because of their detention. But unfortunately for the group, their arraignment could not be held this afternoon and they will be spending the night in lock-up at Queen Street Police Station. Moncada, Balico, and Ortiz, who is a footballer player, were able to produce their passports which show they are in Belize illegally, but Hernandez could only produce an ID. Moncada has been living in Belize since 2007, while Balico since December 2013, and Ortiz, the footballer, since 2010. Once their entry permit expired, they did not seek renewals. Contreras has already been levied with four counts for employing persons not in possession of valid temporary working permits and he will be arraigned on Thursday. Only the Spanish ever get busted what about all the illigal Africans. Haitians jaimacans what asi ou all of them which I can tell you number in the thousands why is it that not one of them is ever busted I’ll tell you why because of this racist bigot judas barrow and his gov. That’s why unu Betta remember my words when it’s time to vote all a unu Spanish. YA! I AM JET BLACK , BUT I CAN SEE THE INJUSTICE THEY DO TO OUR BELIZEAN SPANISH. POOR SOULS , THEY HAVE NO MONEY LIKE THE CHINESE NOR THEY BLACK TO QUALIFY. @Rod you are the one that is “Racist”!!! If they were working illegal and got bust it is what it is a “Crime”!! The Blacks in Belize get their fair share of bust or mistreatment if you will. You and others who think Racist like urself, is the ones poisoning Belize!!! black american you need to stop being a fascist masochistic bigot! the way u respeond is wat shows u to be really ignorant and uneducated. it is people like you who give belizeans a bad name! you and others like you are poisoning our country! Sensational trial of Aracely Cahueque continues in Belmopan; who killed Raylene Dyer?